Max and Ollie, brothers and founders of the Ricker Racker Club, have their own secret handshake. They even have their own secret password. And a turtle named Albert. Only boys are allowed in the Ricker Racker Club--an institution that demands either feats of bravery or the doing of something nice. To be fair, the boys do introduce a Girls' Tuesday for the club, something Poppy wholeheartedly takes advantage of. As the weeks go by, the boys set about performing major feats of stunning bravery, while Poppy tends to focus on kindness. Giving the boys her jelly and ice cream. Cleaning their bedroom for them. Eating all their vegetables for an entire month. I wonder if you can guess how? This is such a lovely story that employs good old-fashioned storytelling so very well--with elegantly-penned text and deliciously subtle messaging that really touches the heart. I love that this tale has an olden-day feel to it--of outdoor adventure and acts of bravery and excitement--that take place far from a games remote and static screen. The gorgeously modern illustrations, with retro stylings and colours, are energetic, textured and warm--and are a perfect marry for the text. 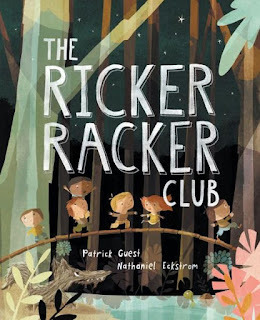 These elements combined make The Ricker Racker Club something children will return to again and again--for the story itself, and also for the smile-inducing ending.